Open Fiddler and from the menu bar, go to Tools, and then select Options. Select the HTTPS tab in the dialog box and check the Capture HTTPS CONNECTS and Decrypt HTTPS traffic checkboxes so that the HTTPS traffic is captured and then decrypted. If it is the first time you are enabling this setting, Fiddler will prompt you to install a certificate. Install the certificate and restart Fiddler so that the new settings take effect. 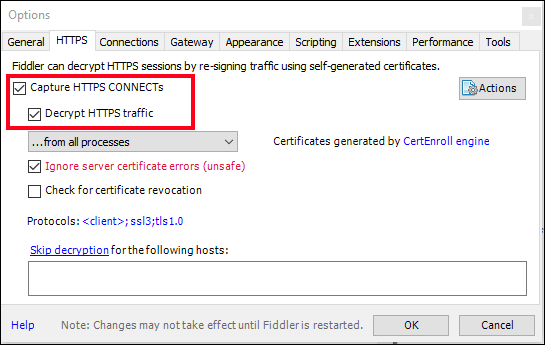 If you have run Fiddler in the past and get a NET::ERR_CERT_AUTHORITY_INVALID error, in the HTTPS tab, click the Actions button and choose Reset All Certificates. This will also present a number of prompts for the new certificates to be installed. 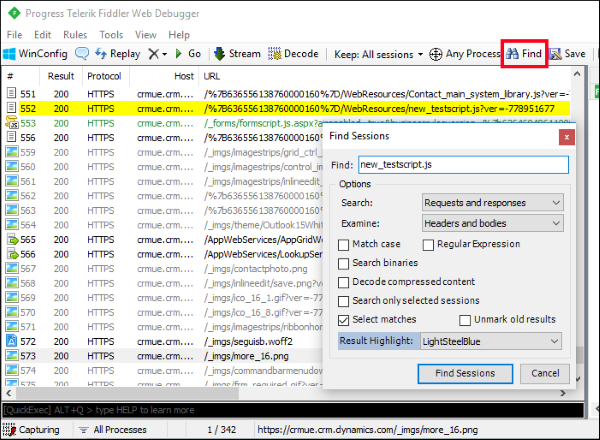 Open the page in your Dynamics 365 for Customer Engagement apps instance that you want to debug. Start the Fiddler trace capture by clicking the Capturing button in the bottom left corner. If you want to capture HTTPS traffic only from a particular host, on the Filters tab, in the Hosts area, in the -No Host Filter- drop-down select Show only the following Hosts from the menu and enter the list of domains from which you wish to see traffic, separated by semi-colon. More information: Filters reference. Perform any operation necessary to load the script you are testing. You can stop the capture by clicking the same Capturing button again. Select the trace log sessions from the left pane and search for the file you want to setup the AutoResponder for. You will see the rows that match with your search criteria highlighted in the left pane. Select that row. In the right pane, select the AutoResponder tab. 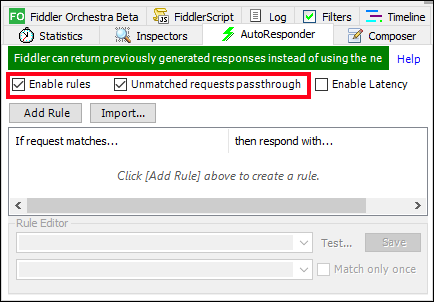 In the AutoResponder tab, select the Enable rules and Unmatched requests passthrough check boxes. 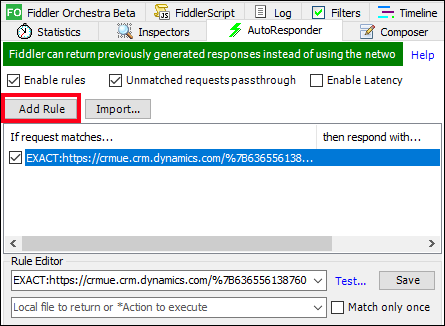 Ensure that you still have the session related to your target file selected and then click on the Add Rule button in the AutoResponder section. This adds a new entry into the rules table. When the rule is selected, the Rule Editor at the bottom has the top row populated with the Session URL related to your file and prefixed with a string like EXACT:. The bottom row is left blank. Type the path to your local file on your disk on this bottom row and Save. 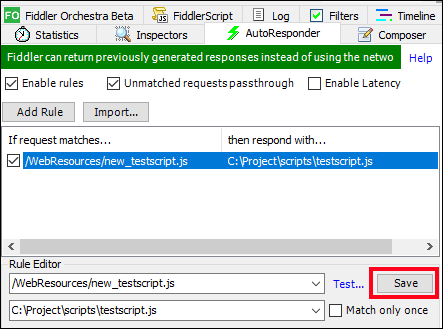 By following the above steps, Fiddler is configured to listen to the requests and responds with the local file instead of passing the request over the network. Apply changes to your local file. Start Fiddler trace capture again and go back to your browser and hard reload the page with empty cache. In the browser developer tools you can see that the file that is now received will be the local one. Continue repeating this process while updating your code until you get the results you require.